Could Gov. 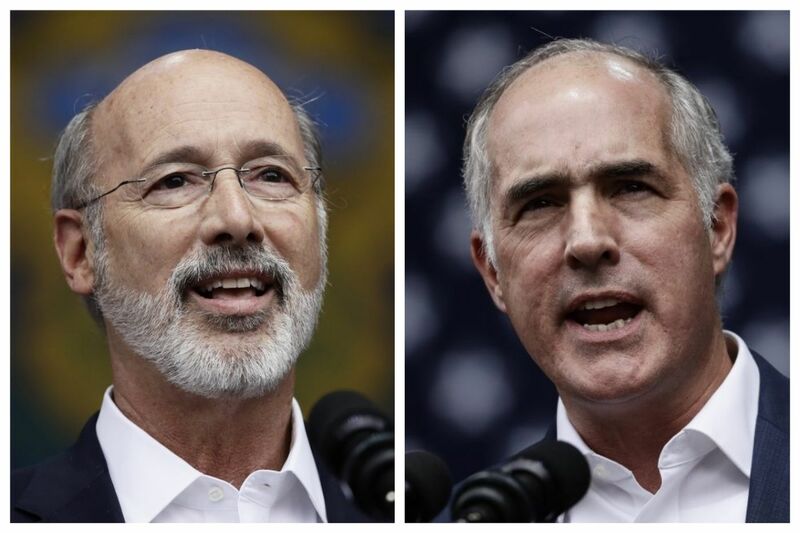 Wolf (left) and U.S. Sen. Bob Casey be a vice presidential pick for a 2020 Democratic nominee? With the midterms (mostly) over, Clout turns to the 2020 presidential election, just 718 short days from today. And who better to light that spark than former Vice President Joe Biden? The Delaware Democrat headlined a fundraiser in Philadelphia Tuesday for U.S. Rep. Bob Brady, where he preached about shared American values while knocking President Trump as lacking them. Biden's trademark scattershot rhetorical style mentioned pre-World War II anti-Semitism, a recent New York Times column about civility, and cancer rates in China, among other topics. It was a private affair. So, naturally, we had spies everywhere. The crowd, thick with Democratic ward leaders, local politicians, and labor officials in a riverfront union hall, cheered when Brady introduced Biden by asking, "Do you think he should run?" Biden denounced Trump for saying there "were very fine people on both sides" of a deadly 2017 clash between neo-Nazis and counterprotesters in Charlottesville, Va.
"No president, Democrat or Republican, has ever said that since the Civil War," Biden said. Still, Biden cautioned that Republicans "are not our enemies" outside of rough-and-tumble campaigns. Biden, who was born in Scranton, came back to Northeast Pennsylvania this year to stump for U.S. Sen. Bob Casey, just elected to a third term. He also campaigned for Gov. Wolf. Speaking of Casey and Wolf, we can't help but wonder: Would those Democrats ever consider running for president? And, more plausibly, could one emerge as a 2020 pick for vice president? They both won reelection in a battleground state by double digits, and carried counties that Trump won in 2016. Wolf's spokespeople did not respond to repeated requests for comment. Must mean he's not ruling it out. Casey neither dodged nor embraced our question, saying simply, "I've got a lot of Senate work to do." But he was eager to prognosticate. By Casey's math, the best way for a Democrat to retake the White House is to win Pennsylvania, Michigan, and Wisconsin. Counting on Florida is folly, he said. What Casey noticed from last week's election — significant upticks in voter turnout in Philadelphia, its surrounding suburbs, and Allegheny County — should "be alarming" to Trump, he said. "If those numbers are anything approaching that in 2020, the president will not only lose Pennsylvania, he'll lose by a lot," Casey said. "It won't even be close." After GOP losses, is a shakeup coming for suburban Republican leaders? Nov. 6 was a bad day for Republicans in the Philly suburbs. Really bad. Democrats flipped several seats in Congress and the state legislature, and statewide GOP candidates were crushed in the 'burbs. So Clout wasn't surprised at rumors that the area's GOP might shake up its leadership. In addition to leading Pennsylvania's Republican Party, Val DiGiorgio still heads the Chester County GOP. One high-placed Republican official told us he "has no support in the county." DiGiorgio, for his part, said he has long wanted to find a successor in Chesco who can focus on the job full-time: "It's overdue. I would have liked to do it sooner." He dismissed the notion that he has lost allies, saying, "There will always be naysayers." Chester County Recorder of Deeds Rick Loughery, local Republican Party Executive Vice Chair Steven Sansone, and Uwchlan Township Industrial Development Authority pPresident Joe Toner are some of the names being floated to become the county party's next boss. Changes might be in store for the Delaware County GOP, too. A source close to that area's Republican Party leader, Andy Reilly, said he has had his eye on another position for months: chairman of the Southeast caucus in the state party. If Reilly wins election at a meeting this month, the source said, he'd step down as Delco party leader. A top aide to former Democratic Mayor Michael Nutter was charged this week with six felony counts for allegedly stealing and misusing public money. Desiree Peterkin Bell's questionable spending had been previously chronicled by ex-City Controller Alan Butkovitz as well as the Inquirer and Daily News. One watchdog, though, did not look into her "slush fund": Amy Kurland, Philadelphia's inspector general, charged with rooting out corruption in City Hall. So Clout was surprised when Kurland bragged on Twitter about her role in the indictment. "Grateful to all of the staff and investigators whose hard work is helping keep our City honest! 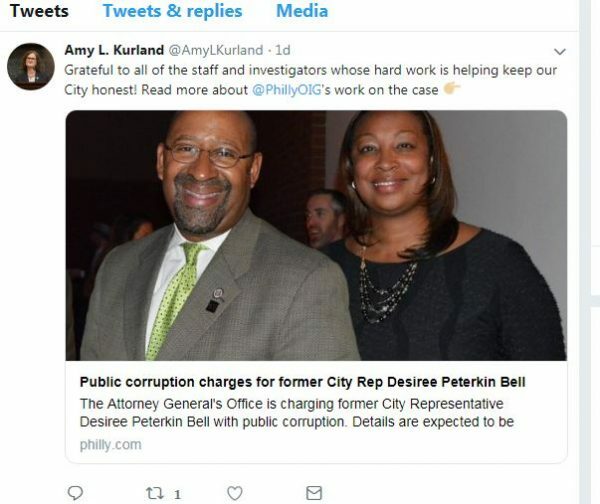 Read more about @PhillyOIG's work on the case," @AmyLKurland tweeted with a hand emoji pointing to an article on Peterkin Bell's arrest. We called Kurland to learn more about her office's supposed involvement in the case. Did we somehow miss an investigation? "We did not investigate that case," Kurland told us. Huh? Wha? What about the tweet? "That's strange," she said, blaming the social media coordinator in her office. Kurland said she doesn't manage her own account. While we had her on the phone, we had to ask: Why didn't she investigate Peterkin Bell? "She was already on her way out the door" when a tip came into the City Controller's Office about her, Kurland said. "Those allegations became known when Nutter had already left." Bell's alleged misuse of money, however, had long been a source of gossip in City Hall. Surely her office had heard about it before then? Minutes later, Kurland's tweet was deleted.